I've had a few Primark trips recently so I thought it was about time that I did a good ol' Primark Haul. A few home-wear bits, some accessories and my £1 easiest manicure ever! Ive also included a mini giveaway in the video and all you need to do comment on the video page. Enjoy! I absolutely love the palm tree shirt! I need it n my life!!! I love Primark hauls ! I love that palm tree tee! You always find the loveliest stuff in primark. I love the palm tree print top , iv been looking for the pink version and skirt for ages ! Yes! Please do a tutorial on how to do rips on jeans! BTW I love your neon bag so gorgeous! I really like the nails and it's a shame the dress was so sheer ! Ive been lusting after this bright neon yellow bag for aages! My primark never seem to sell all these goodies! Love the cute make up bag as well ! Really like hearing about what people purchase on their hauls. I love the video! The bag you are giving away is so pretty! Sadly they don't have Primark in the US so I have never been everything you got is awesome especially eh palm tree shirt! I have to go there when I visit the UK one day! Those aviators look so cute on you! Primark in London is so so so so so good! Love the palm tree top! I'm taking a trip to primark today! Such lovely pieces love the first blouse and palm tree top! I am in love with everything! I love your style so much you always look so nice and you're by far my favourite blogger! My favourite is the palm tree t-shirt, looks amazing! You have made me want to go and do a Primark haul, I've also had my eye on those rings too! ooh those nail-art thingies look cute! Ahhh i've been looking at so many nail tutorials recently, praying for some easy ideas to help my artistically challenged self, those nails are fab! Definitely gonna be my next purchase!! Lovely picks Lily, pleeeease do a short hairstyles video. I'm trying to grow my super short style out at the moment and need some ideas. Great hall, I cant get enough of white sheer style tops! Need to invest in some for the summer. love love love everything! i love those zig zag nails and the sunglasses. cant wait for warmer weather here in Canada. My favourite thing you bought was the palm tree shirt - so super cute!!!! qt alert! 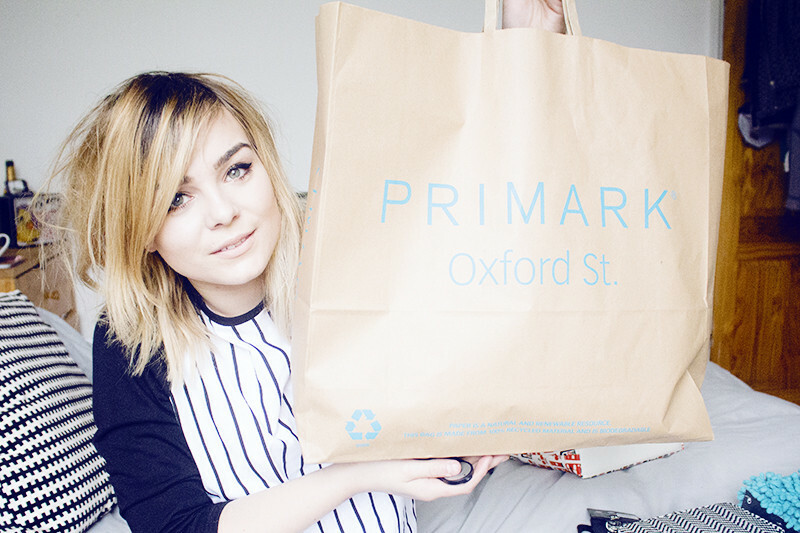 There is nothing better than a Primark haul! I love that feeling of walking out of the store with a huge bag of goodies, and knowing that it's cost so little. Great video - thanks for offering the prizes! I love the shirt and the bag - they don't look primarky at all! I love it all! Best sod off to Primark really, hadn't i?! the palm tree top is definitely my favourite! also i home diy ripped a pair of navy primark jeans a few years ago using scissors, bleach and sandpaper... they look super cute!